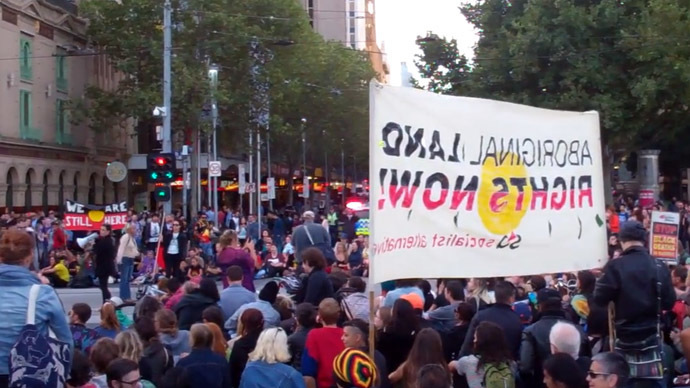 Hundreds have taken part in rallies in Western Australia, protesting the closure of remote indigenous communities in the state, according to local and social media. More than a thousand protesters rallied in front of the Parliament House in the state capital, Perth, according to ABC News. Premier Colin Barnett and Aboriginal Affairs Minister Peter Collier went out to speak to protesters, but were booed. Barnett announced in November 2014, that the state was forced to close 150 out of its 274 indigenous communities due to funding cuts. Two days ago he set the date for consultations on the planned closures – June 30. The Perth rally is one of several taking place all over Western Australia. Amnesty International’s indigenous rights manager, Tammy Solenec, who was speaking at one of the rallies on Thursday, urged against forcing aboriginal people out of their lands. "We all know living in remote communities is not a 'lifestyle choice'," she said, as cited by WA Today. "Aboriginal people have a custodianship of a deep spiritual connection to this land. And under Native Title laws imposed upon them, they must show a continuous connection to the land to prove their title. If they are forced off their homelands, it will be much harder to secure native title." Amnesty International has long campaigned for the rights of the aboriginal Australians to keep their lands. It detailed its stance in a 2011 report. Ghillar Michael Anderson, an aboriginal leader and activist, believes indigenous communities are already being forced out of the lands to which they have their exclusive right. Protests would, according to Anderson, attract even larger crowds if the mainstream media paid more attention to the problems aboriginal people face. It’s not the first protest against the proposed closure of indigenous communities. Last Friday, more than a thousand protesters marched in the center of Melbourne, blocking traffic.